The Arctic tundra is a brutal environment for any life, including the Arctic or snowshoe hares that inhabit it. Temperatures are well below freezing much of the year, and there's little vegetation on which to feed. Then, area carnivores are equally desperate for a good meal. While polar bears are the reputed kings of Arctic predators, they can't catch a rabbit. However, smaller, faster, more agile predators are a threat. The Arctic wolf is a subspecies of the gray wolf that lives in the Arctic tundra regions of North America and Greenland. These creatures have the fortunate distinction of being the only wolf sub-species that isn't classified as threatened or endangered. These wolves are prime threats to rabbits, possessing the physical capabilities to catch them and a definite taste for them. They also hunt larger prey like muskox and caribou. 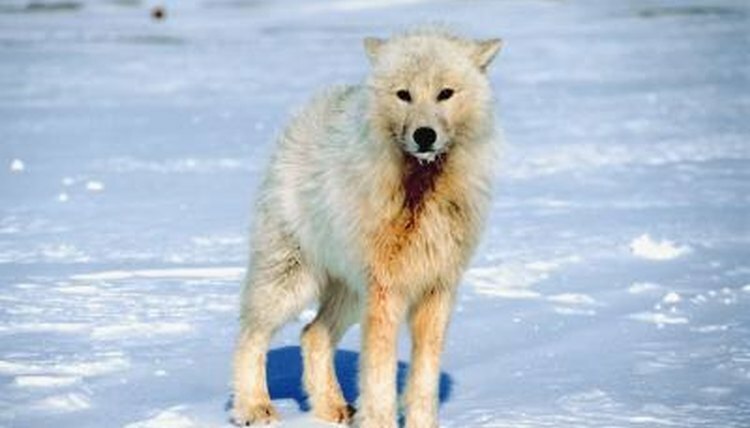 Arctic wolves have white coats that help them blend in with their snowy surroundings and they grow to about 5 feet long and weigh about 130 pounds. Arctic foxes rely heavily on rabbits for sustenance, as well as other regional rodents, birds and fish. They are hardy critters built to withstand the cold, and they make their homes in underground burrows for shelter. Like Arctic wolves and many other tundra animals, these foxes have white fur that provides camouflage. They typically reach about 2 to 4 feet from head to tip of tail and weigh somewhere in the vicinity of 12 pounds. Of the 11 bird species that stick around the Arctic tundra all year long, gyrfalcons pose perhaps the most significant threat to rabbits on the ground. This is the largest falcon species in the world. They prefer to eat smaller birds like ptarmigans and waterfowl, but rabbits, voles and other rodents certainly aren't passed up. Gyrfalcons have white breasts and underbellies and gray to brown feathers elsewhere with darker wingtips. They hunt primarily from the air, but do sometimes perch to watch for food. The snowy owl is the other predatory bird that snacks on rabbits in the Arctic tundra. It features beautiful white plumage. Snowy owls are a larger owl species, with bodies averaging about 2 feet long and wingspans reaching over 4 feet. They weigh about 5 pounds and can live upwards of 9 years in the wild. Lemmings are the primary source of sustenance for these patient perch hunters, but they often supplement with rabbits and other rodents, as well as fish and smaller birds. Unlike most other owl species, snowy owls are diurnal, not nocturnal.